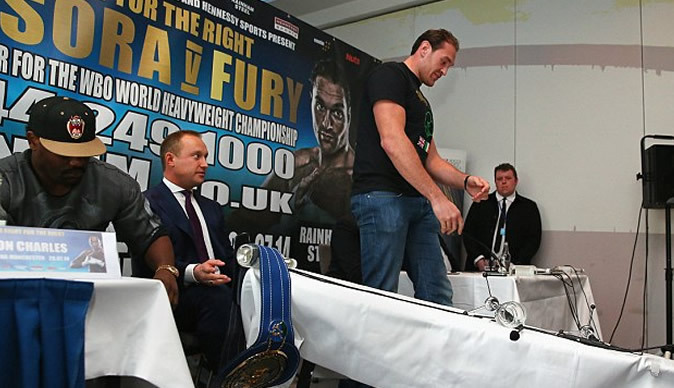 MANCHESTER: British boxer Tyson Fury lived up to his name by tipping over a table and shouting expletives before storming out of a news conference ahead of his world heavyweight title eliminator against fellow Brit, Dereck Chisora. Fury was sitting alongside Chisora at a media event in Manchester on Thursday when he exploded, screaming "listen, I'm Tyson Fury, I'm the best heavyweight on the planet, this idiot is getting knocked spark out and I'm sick to death of this." He added: "This motherf****r is going to sleep" before he slammed down the microphone, flipped up the table that had glasses on it and left the room. Chisora applauded Fury sarcastically before saying "shall we give him a Golden Globe or not?" "He needs to get a bit of publicity - he needs people to talk about him. But we just laugh," Chisora said. The pair will meet in an all-British fight on July 26 for the right to challenge Wladimir Klitschko for his IBF, WBA and WBO belts. The pair met previously at Wembley in 2011 when Fury won a points decision to claim the British and Commonwealth titles. Enough: Fury flips over a table and storms out. Chisora also has a reputation for poor behaviour out of the ring. He made headlines in Germany with his bout against Vitali Klitschko in 2012. He slapped the champion across the face in the pre-fight buildup before brawling with David Haye at the post-fight press conference. Chisora credits anger management sessions for the way he dealt with Fury's antics. "My emotions are more calmed down now," said Chisora. "With him swearing at me, two or three years ago we would have been rolling around on the floor right now. "I'm not a punk, don't look at me and think that. I'm more of a gangster than anybody else. But, as you can see, right now I'm very calm. I'm a boxer, a professional athlete now."